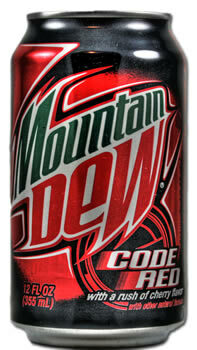 Mountain Dew Code Red is a variety of Mountain Dew (from PepsiCo), but has The same caffeine content as regular MD. This soft drink has a distinctive cherry flavor instead of the normal citrus flavor. A diet version of Code Red is also available (sweetened with aspartame, ace-k, and sucralose). 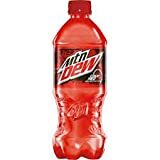 Since Mountain Dew is one of the most caffeinated and sugary sodas available, parents should use caution in giving Code Red to their children. A 20 Ounce Code Red would have as much caffeine as a weak cup of coffee and as much sugar 2 1/4 Snickers candy bars. Carbonated water, high fructose corn syrup, orange juice from concentrate, citric acid, sodium polyphosphates, natural flavor, sodium benzoate (preserves freshness), caffeine, sodium citrate, gum arabic, erythorbic acid (preserves freshness), calcium disodium EDTA (to protect flavor), red 40, potassium benzoate (preserves freshness), brominated vegetable oil, yellow 5 and blue 1. How Does Mountain Dew Code Red Compare? 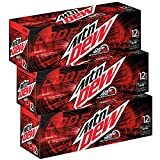 Mountain Dew Code Red contains 4.50 mgs of caffeine per fluid ounce (15.22mg/100 ml).